To the recent decision on March 15th -- the Ides of March -- to close the banks through Tuesday? To haircut Cypriot-bank depositors over €100,000, 9.9%; and most significantly insured deposits under €100,000, 6.5% so that when these depositors go to the bank, each €100 of their deposits on Friday will be worth €90.10 and €93.50 respectively on Thursday when the banks re-open? To exempting bondholders from this haircutting exercise on the grounds that Cyprus has issued so few bonds? To exempting depositors in the branches of Greek banks in Cyprus from the haircutting exercise so as not to spook quiescent Greeks in Greece and trigger runs on their banks? To packaging this depositor devaluation of euro bank accounts in Cypriot-European banks as a one-off "tax"? To explaining it as depositors paying their fair share of the Cyprus bailout negotiated by the EU, the IMF, the ECB, the Cypriot government... and, indirectly, Russia (among other foreigners) — because there are many Russian depositors in Cypriot banks. Is this a messy devaluation of deposits in one of the eurozone's back alleys? Is it just a bad decision, or as The Economist put it - a decision that was "unfair, short-sighted and self-defeating "? Or, is there larger, longer-term meaning? For example, could the longer term meaning be what many commentators are saying: Watch out! Bank deposits throughout Europe are unsafe!? Symptomatically (i.e. is Cyprus a symptom of something beyond itself). So why is Cyprus irrelevant? A few orienteering facts. Cyprus is legally the Republic of Cyprus in the south (about 60% of the area); the Turkish Republic of Northern Cyprus in the north (about 35% of the area). The other 5% of its area is split between a UN cordon sanitaire between North and South and a British base. Imagine Cyprus' location this way. Southern Turkey is 47 miles to the north. Western Syria: 65 miles east. Total population: about 1.1 million. There are about 300 cities worldwide with populations greater than 1.1 million. 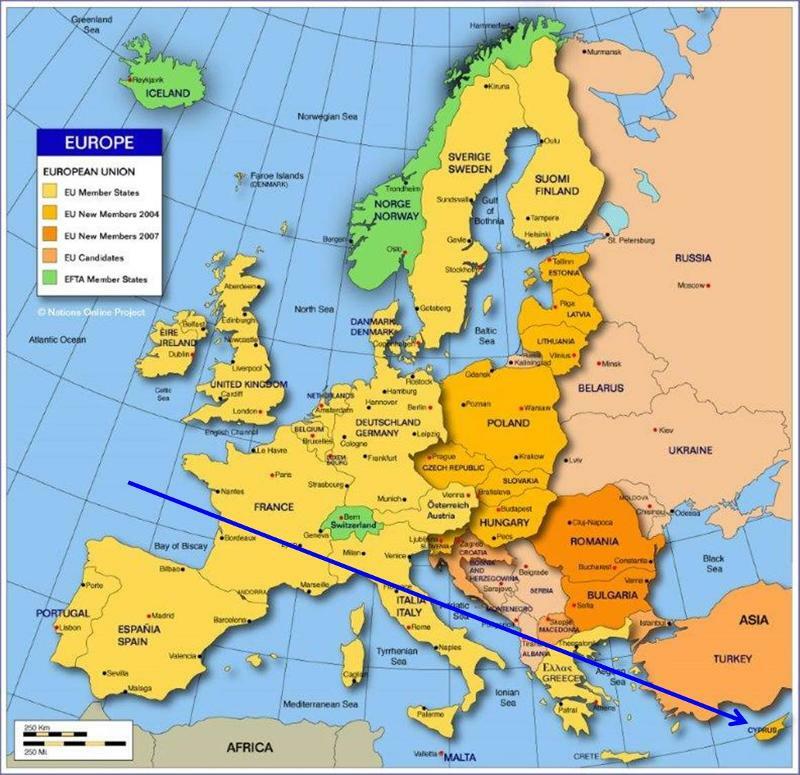 The Cyprus we are talking about is the Greek south which joined the European Union in May 2004. Depositors of Cypriot banks are to be 'bailed in' in all but name. The amount is €10 billion. Of this, €6 billion is being borne by depositors large and small. "Large" and uninsured are those depositors with more than €100,000. Small and insured depositors' share of the hit is estimated at €2 billion or 20% of the bailout. About 50% of depositors are foreign. The banking system is widely known as a money-laundering mecca with a widely diversified global client base. Large depositors have been receiving about 6% annually on their money for the past three years. Small deposit rates have been about the same. All - large and small - have known a crisis was coming that might involve a bank default. Even a deposit "tax" was discussed openly last week, though Cyprus' President denied — misleadingly as it turned out — that a tax would be levied. Yet depositors continued to keep their money in bank deposits, compensating themselves for the risks they were taking with high rates. Why not exempt small insured depositors? In my view it would have been desirable for insured depositors to be spared, for haircuts on deposits over €100K to be big enough to provide the total recapitalization needs of the banks, and for the losses to reflect recapitalization needs of each bank. The bailout was supposed to be €17 billion in the form of a loan. Had it happened, Cyprus' debt would have skyrocketed and been too-big-to-repay. Had the bailout not happened, including the current one, Cypriot banks would have defaulted. By making foreigners and Cypriots pay 1-2 years' worth of interest received, Cypriot debt has fallen to 100% of GDP. The debt problem is manageable. Why did Cyprus go the route of seizing deposits? Why didn't it haircut bondholders? In my view they should have. Ideally. But this wouldn't have solved the issue. Since public and private Cypriot institutions can't issue bonds, there are very few bondholders to haircut. If they were going to haircut depositors, why not just target foreigners and leave the little guy alone? Cyprus is going through this in part because it doesn't want to lose its status as a money launderer's paradise by cutting only foreign deposits, so it is making a deliberate decision to pick who gets a haircut. In other words, if Cyprus exempted Cypriot taxi drivers and targeted only money-laundering foreigners, the foreigners would leave and the taxis would be empty. And if many foreigners had many small-deposit accounts, by not targeting those, they would have let many foreigners off the hook. That was the rationale: don't mess up your main business. In fact it's even more complicated. Cyprus wants Russia to extend a sovereign loan of €2.5 billion for another 5 years. Wouldn't that be easier if large Russian depositors weren't targeted exclusively? So seems to have run the thinking. Finally, and importantly, the Cypriot economy and Cypriot banks are not connected in any serious way to Europe. There is zero real contagion potential. From newspapers to money managers we're hearing about how the collaboration of the EU, ECB and IMF (the troika) in this decision is evidence that depositors throughout Europe are in danger of weekend deposit massacres. We're hearing from an eminent bank like Barclays that bondholders in strongholds like Germany, Switzerland and the Netherlands are on weak ground. I think these views are, at best, a reflection of psychologically-based rather than reality-based fears. And here is where Cyprus does have some meaning. It's hitting people where they're most fragile - in the solar plexus of their confidence. Psychologically meaningful — for a passing moment. When I first heard about the deposit haircut on Saturday morning - the 16th, my first reaction was There they go again! "They" being European politicians and other euro-crisis handlers like the IMF. How could they do something so stupid! The optics of it alone would be awful. Pictures of people standing outside banks. Interviews with "little guys" — innocent bystanders. The event also confirmed my view that today we have more to fear from political than from economic risk. We had been following Cyprus for months. As an event, it was entirely expected. It was the specifics of the action that initially bothered me. I read a number of articles including emails sent my way. Sure enough, others of high standing in the investment world were emoting. Ich bin ein Zypriotischen! I too am a Cypriot. We are all Cypriots. All of us could have had our deposits confiscated! All of us will one day! This too shall pass - maybe with an adjustment or two. One thing I have learned over the years in investing is: never invest emotionally. That doesn't mean don't trust your instincts, intuition, enthusiasms. I have plenty of all three. It means don't let them drive the car. As I investigated, I realized what I've already described before - that the economic reality of Cyprus was not meaningful and that the decisions taken there stemmed from a unique set of facts not present in the rest of Europe. Psychology was the problem, in the sense that fear and loss of confidence can have an infectious effect. And for this reason I fully expected that psychological contagion would happen - as it already is happening. For an hour? For a day? For a week? For a month? All possible. I also fully expect that as the psychological dimension unfolds one of two things will happen: either emotions will die down as Cyprus is understood; or the authorities will take steps to deflate the fear balloon. After all the successful efforts he's made to bring systemic calm to Europe, the ECB's President Mario Draghi for one is unlikely to stand by and watch decisions in Cyprus rock the European core. But in the end, the psychological upset will pass. Remember Greece? Bondholders haircutted 75%? And what happened? The haircut occurred in a frenzied period. And then... bondholders came back. And bondholders have prospered since. Look at the chart and the upward move of Greek 10-year Governments. But as I pondered this, it tied in with broader thinking we've been doing on Europe. It occurred to me that Cyprus' meaning was not the phenomenon itself or its passing psychological effect. Its meaning was as a symptom. A further symptom of Europe's divergence. The economic divergence of the north of Europe from the south. For example, Germany's greater trading interest in the northern rather than the southern countries. The divergence of political risk - less in the north, more in the south. The divergence of culture - more balkanization of northern European values and thinking from southern European values and thinking. In Germany Mrs. Merkel is strongly supported for not bailing out Cyprus and its money-laundering economy. In the south, Germany and the North are looked at as hard-hearted and flat-footed. Divergence, in my view, has supplanted systemic risk as Europe's most likely source of risk and also the source of its most interesting investment opportunities. Divergence in Europe is here to stay. Whether the euro is forever or for naught. Cyprus is just one more symptom. That's all. That's enough. And that's its meaning - once the dust settles.